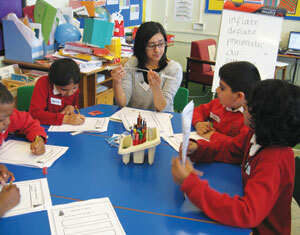 Placements are vital to our teacher training programmes. Whichever age phase you choose to specialise in as a trainee teacher – primary and early years, secondary or post-compulsory – you will undertake placements that enable you to develop a clear understanding of how schools and other educational establishments operate. All students are inducted into the teaching profession and are required to integrate elements of current practice theory into their role while they undergo training. You learn to implement teaching strategies on both block placements and serial placements. As part of your learning and professional development skills, you receive feedback from your placement mentors. You will be asked to produce evidence that demonstrates your success against the Standards for Training Teachers guidelines, which identifies aspects for development in the first year of teaching. 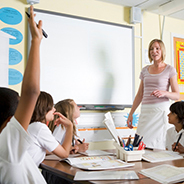 Placements are offered to students undertaking undergraduate and postgraduate teacher training courses and to those on non-teacher training courses such as the three year full-time Early Childhood Studies BA (Hons) degree, the Working with Children, Young People and Families BA (Hons) degree and the Education Studies BA (Hons) degree. For all those undertaking placements you will have full access to support and pastoral care from our staff. One of the most important things for students, as part of their teacher training, is actually equipping them to work in a wide variety of different schools, in as many different schools in as many different areas. I know I really valued that when I trained at Birmingham City University. What is it really like to be on placement? All students on our Primary Education course take part in extensive placements to enhance their learning. Current students Abigail, Esma and Zoe provide an insight and share their experiences of life as trainee primary school teachers in a blog. “I was excited about being in a small class as I thought this would make getting to know the children a lot easier. By the second day I knew all the children’s names - they were so impressed!” Abigail said.